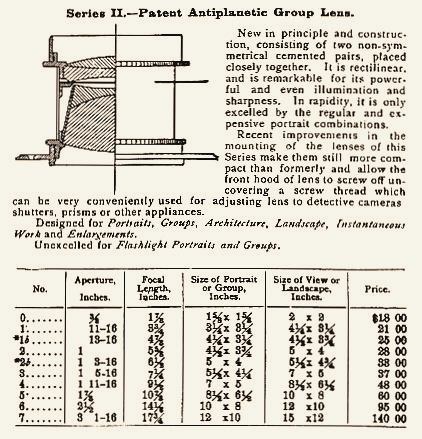 The Group Antiplanet was originally patented in 1881. It has two non-symmetrical pairs and is rectilinear. As can be seen in the reference, the asymetrical design featured a relatively thick cemented rear doublet. This was done in the belief that certain aberrations would be reduced, but in actuality, coma increased. Steinheil believed the Group Antiplanet to be good for just about anything a photographer would ever want to do: Portraits, Groups, Architecture, Landscape, Instantaneous Work and Enlargements. This lens is mounted on the St. Louis Reversible Back Camera. It is 33 mm, corresponding to a No.3 (7-1/4" focal length) in this reference. 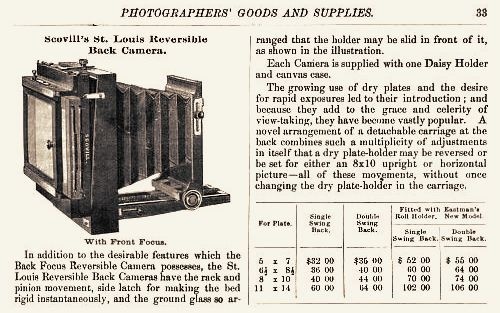 The camera is identical to the St. Louis Reversible Back Camera by the American Optical Company. Refer to the Flammang's Revolving Back Camera References page for a catalogue entry of the revolving back version.